Bhutan is country of many contrasts. To the outside world, it is a nation of many colorful festivals and the birthplace of Gross National Happiness. It is also a country with breathtaking natural landscapes and distinctive architecture. But what the tiny Himalayan Kingdom is most famous for is its rich and unique culture and centuries-old traditions. The Bhutanese landscape is filled with amazing sights seeped in mythology and religion. Here is a look at six of Little Bhutan’s favorite attractions for visitors. The Tiger’s Nest is without a doubt the most visited and the most photographed of all the monuments in Bhutan. Nestled on the edge of a 3,120m-tall cliff, above a beautiful forest of blue pine and rhododendrons, overlooking the Paro valley, the monastery is of tremendous religious significance to the Bhutanese. Legend has it that Guru Rinpoche flew to this site on the back of a tigress to subdue a local demon. Thereafter, he meditated here for three years, three months and three hours. It was here that Buddhism took roots in Bhutan. The monastery was built in 1692 to honor and worship the Guru. The hike up to the Tiger’s Nest is give-or-take a two-hour ascent and, the view from the top, is well worth the climb. Standing majestically at the confluence of the Pho Chhu and Mo Chhu rivers, the dzong (fortress) was constructed in 1637-38 and is the second oldest dzong in the Kingdom. The dzong houses the sacred relics of the southern Drukpa Lineage of the Kagyu school of Tibetan Buddhism, including the Rangjung Kasarpani and the sacred remains of Ngawang Namgyal and the terton Pema Lingpa. It was the administrative centre and the seat of the Bhutanese government until 1955, when the capital was moved to Thimphu. Today, it is still the winter residence of the Je Khenpo (Chief Abbot) and the monastic body of Bhutan. Set against a spectacular backdrop, the architecture of the dzong is simply awe inspiring. 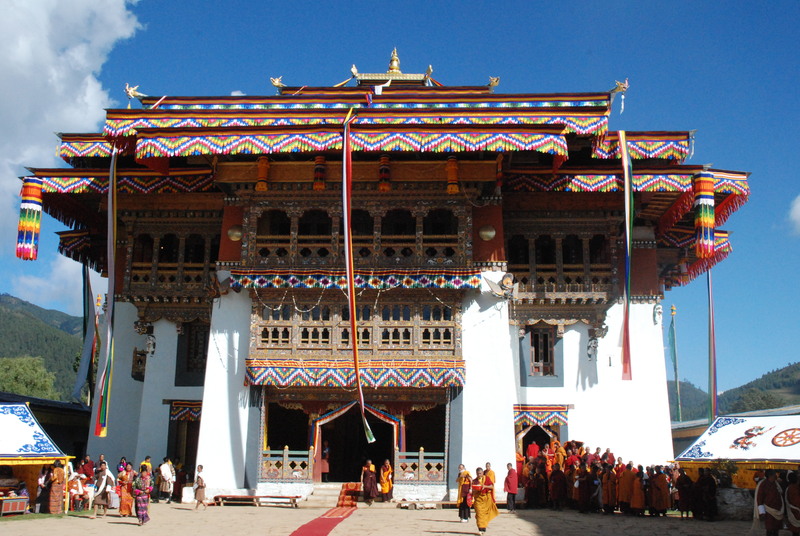 It was in Punakha dzong that the wedding of His Majesty King Jigme Khesar Namgyel Wangchuck and Her Majesty Queen Jetsun Pema was held on October 13, 2011. 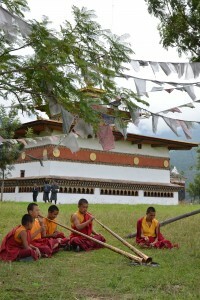 Only a half-hour drive from the capital Thimphu, Dochula Pass is a popular spiritual site for both locals and visitors. Offering a 360-degree panoramic view of the majestic Himalayan Mountain ranges, including Bhutan’s highest peak – Gangkhar Phuensum, most pilgrims come here to pay homage to Bhutanese soldiers who perished fighting Indian extremists in Bhutan’s southern borders in 2003. There are a total of 108 Chortens perched side by side, built by Her Majesty the eldest Queen Mother Ashi Dorji Wangmo Wangchuck, to honor the soldiers. Standing tall in the Pass is also the Druk Wangyal Lhakhang (temple) built in honor of His Majesty the fourth King Jigme Singye Wangchuck. The past and future appears to merge in the architectural details of the Lhakhang and its structure tells the story of a supreme warrior figure whose vision pierces the distant future in a fine blend of history and mythology. Of all the religious figures of Bhutan, perhaps no one is as popular as Drukpa Kunley or The Divine Madman. The maverick saint was so revered that a temple – Chimi Lhakhang (translating to ‘Temple of the Divine Madman’) was built in his honor. 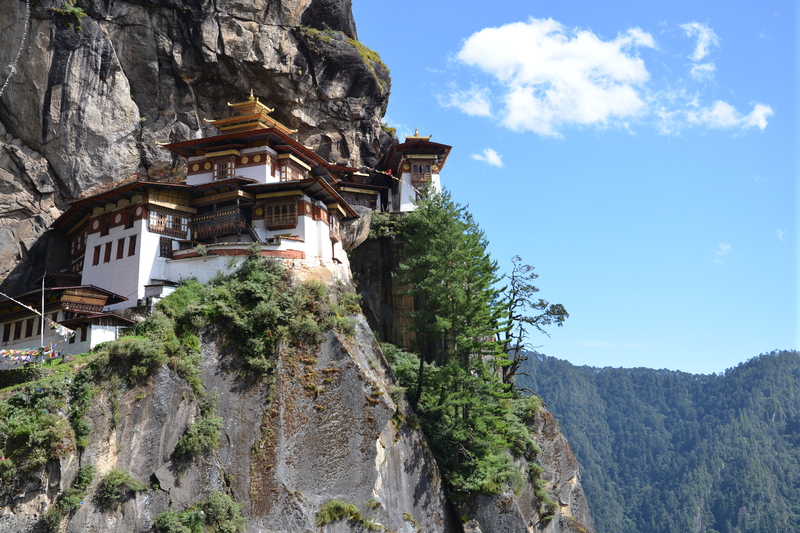 Legend has it that Lama Kunley subdued a demon of the region with his ‘magic thunderbolt of wisdom’ and trapped it in a rock close to where the Lhakhang now stands. He was known as The Divine Madman for his unorthodox ways of teaching Buddhism often with sexual overtones. He is also the saint who advocated the use of phallus symbols that even today adorn Bhutanese paintings and houses. 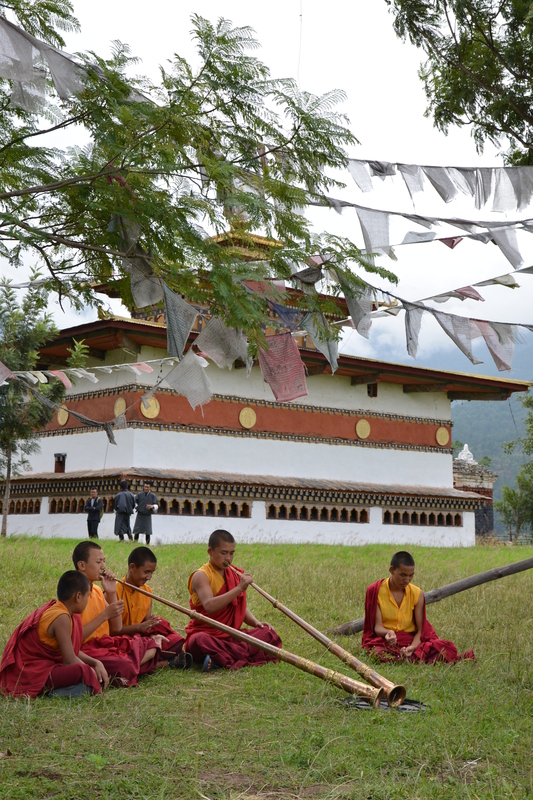 The Lhakhang is believed to bless couples who seek fertility and children. The monastery is the repository of the original wooden phallus that Drukpa Kunley brought from Tibet. It is used to bless people who visit the temple on pilgrimage, particularly women seeking blessing to beget children. 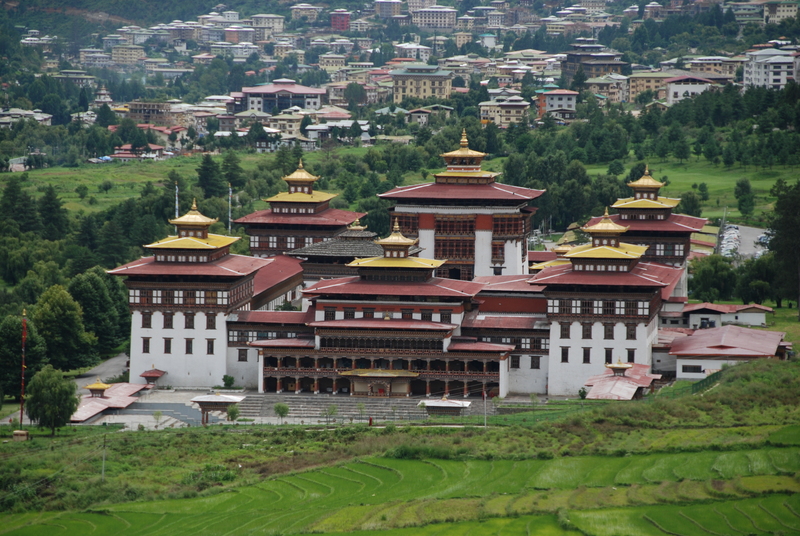 Blending seamlessly into the green Thimphu valley surrounding it, the Dzong (fortress), along the bank of the Wang Chhu, is an architectural delight and houses the throne room, and offices of His Majesty the King and the ministries of home affairs and finance. It also is the summer residence of the dratshang (monk body). Destroyed by fires in the 1700s and by an earthquake in 1897, it was rebuilt in 1902. Today, surrounded by well-kept lawns and beautiful gardens, the massive structure provides a majestic grandeur to the city. 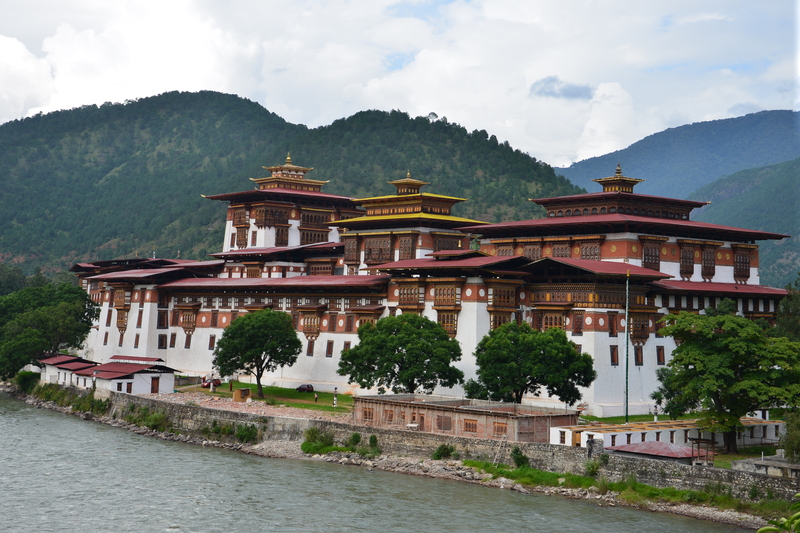 Visitors can marvel at Bhutanese architecture and craftsmanship at its finest, where the entire fortress was built without the use of any nails. Its courtyards are a place of gathering for the locals, dressed in their best attires, during the annual Tshechu festival. By nightfall, the dzong is lit up in white and red lights, illuminating it in an elegant glow. 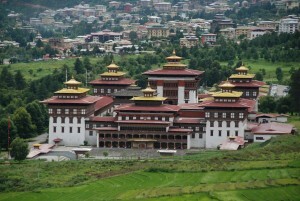 The Gangtey Gonpa or Gangtey Monastery is bounded on the west side by the Black Mountains (above 5,000 meters). 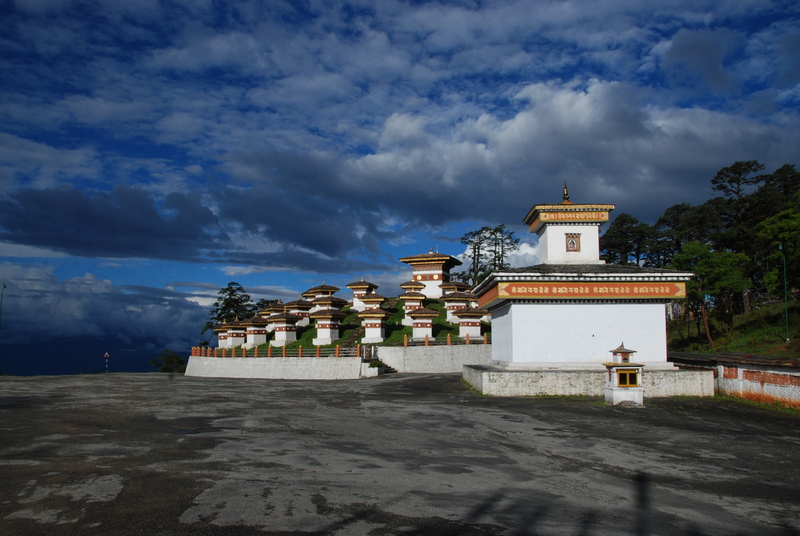 This monastery in Wangdue Phodrang district in central Bhutan is located on a spur amidst the Gangtey village, overlooking the vast Phobjika Valley. The monastery commands striking views of the Valley where the Black Mountain region is inhabited by nomadic shepherds and yak-herders. 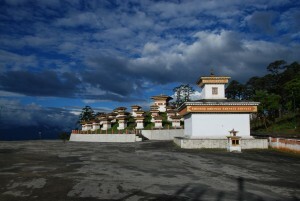 Gangtey Gonpa is an important monastery of the Nyingmapa school of Buddhism, the main seat of the Pema Lingpa tradition. During the winter months, the Crane Festival marks the arrival of Black-necked Cranes from the Tibetan plateau. The sacred birds that migrate here are held as a religious blessing by the people, and their arrival is a big event not only in the Valley but also in this monastery. The Black-Necked Crane Festival is held on November 12, every year.